Coaching, and Consulting; Spiritual Teachings and Writing. 4th Blog: Marriage. Traveling together, and exploring a simplified life. 5th Blog: Some memorable travels. Individual Counseling, Coaching, and Consulting. 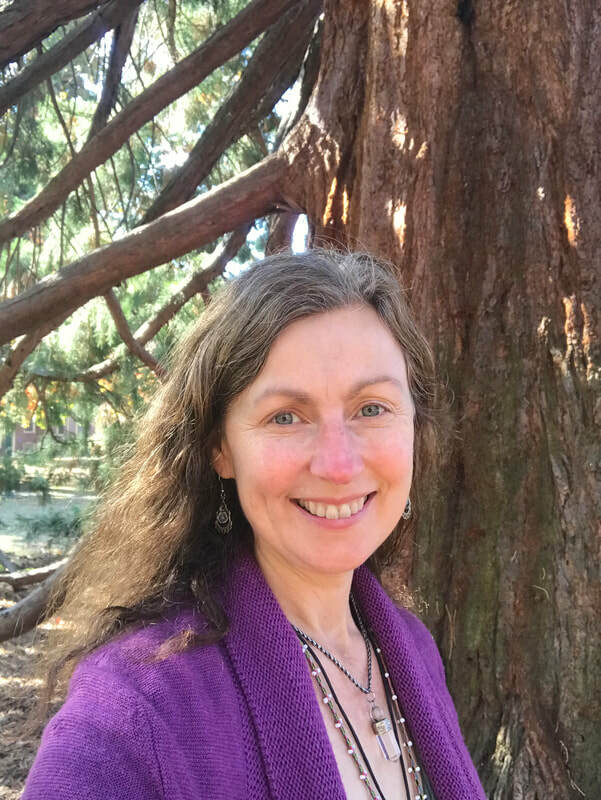 "I blend mindfulness and cognitive-behavioral strategies, and rely on a empowering counseling and coaching style focused on skill-building, problem-solving, and attuning to one's individual strengths and intuitive knowing. Neurofeedback, and Heart-Centered Hypnotherapy now available!" Visit PSYCHOLOGY TODAY online listing for a description of my clinical services, rates, and the insurance panels I am on. As a Licensed Clinical Social Worker, LCSW, I offer professional counseling services in a professional, bright and private office space. Using supportive counseling and coaching strategies including mindfulness and cognitive-behavioral strategies help to address symptoms of anxiety, worry, fear, insomnia, life adjustment issues, ruminating thoughts, anger, depression, stress, grief and loss, PTSD, chronic illness, attention-deficit, pain management, and more. Also providing Neurofeedback, and Heart-Centered Hypnotherapy. ​ More Personal Growth Books coming! ​There is a love akin to a current in that it flows through all of us. This is the latest manuscript I've been working on, and hope to have a finished product to share in 2019, along with some workbooks (2019 and 2020). -May all being have enough. May all our needs be met and more. "The spacious awareness within us contains everything." Consulting: Advocacy, Advice, and Assistance to Clients and Families Facing Transitions, Stress, and Life Adjustment Issues due to Aging and/or Disabling Conditions. I've worked in the human services field for 30 years, over 13 years as a master's level medical social worker. 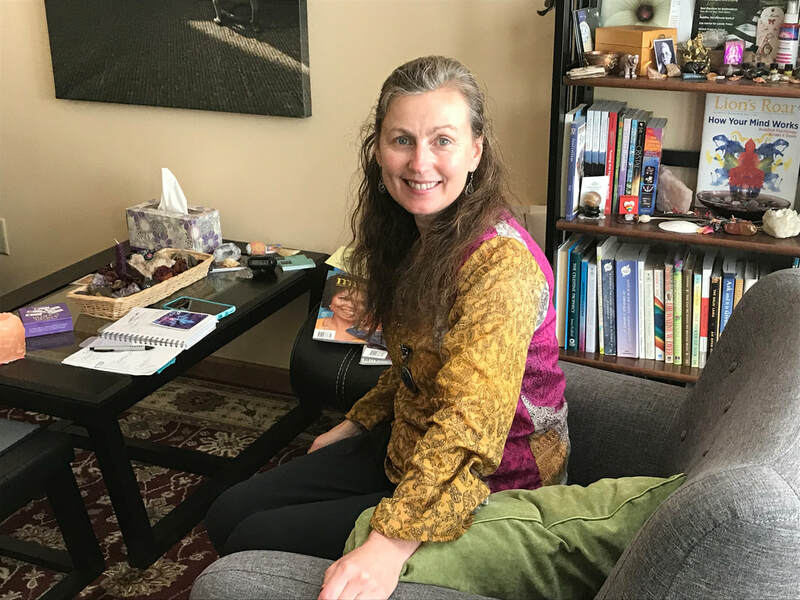 Personalized Coaching Sessions can focus on a variety of subjects important to you, including the pursuit of a happier life, expressing your creativity, developing concrete plans to explore your dreams, problem-solving, bringing greater mindfulness into your daily life, healing, using emotions as a tool for releasing blocks, empowerment, breath-work strategies for transforming emotions, deepening your spiritual practice, bringing renewed energy, focus, and meaning to your life, overcoming personal and spiritual roadblocks, working with chakras or accessing greater life energy, strategies for moving from a space of contraction to expansion, supportive coaching for meeting health and fitness goals, opening the heart center, skills for focusing intentions for reaching goals, preparing for a spiritual pilgrimage or meditation retreat, learning to meditate and other daily mindfulness practices to enhance your day-to-day experience, energy healing, and reinforcing the truths you already know within yourself. For more information about my path to awakening the heart, my spiritual approach and practices, my personal experience with transforming emotions, and for step-by-step instructions for increasing mindfulness in daily life and a variety of meditations, please refer to my book, Bringing Home the Mountain: Finding the Teacher Within by Cathy Rosewell Jonas (published in 2010). Let's make this life journey as meaningful as possible! Starting January 3rd, 2019. 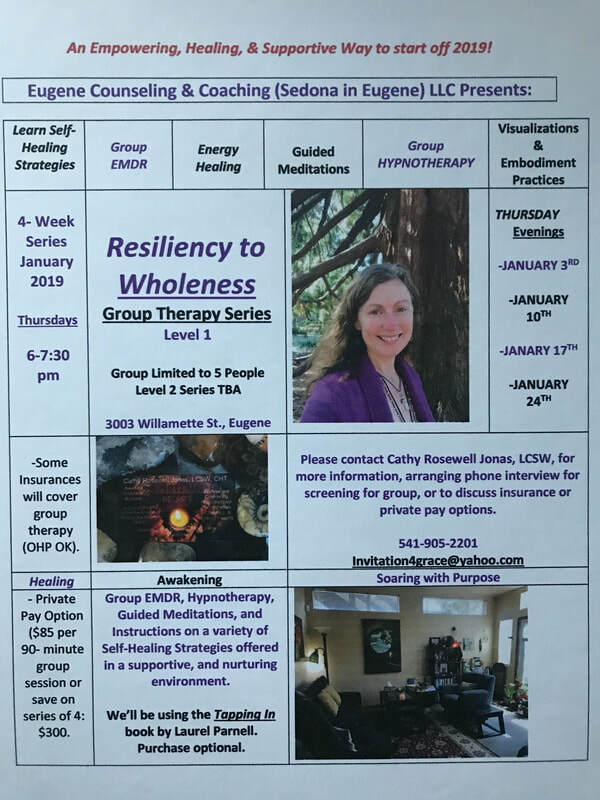 4-Week 'Resiliency to Wholeness' Group Therapy Series. This is Level One. Contact for more information. Some insurance coverage possible, vs private pay. Click flyer above for more information. Now offering EMDR (Eye Movement Desensitization & Reprocessing). I'm an EMDRIA Approved EMDR Therapist. I also offer EMDR Intensives. These are 2-Hour Sessions. Contact for information. Create your own renewal experience! Providing Infra-Low Neurofeeback, Alpha-Theta, and Synchrony training using The Othmer MethodR). Also learn cognitive-mindfulness & wellness strategies to use in daily life. May we all awaken to the one heart, the great Heart of Consciousness. No matter where we are or what may be happening, connecting with the Self, our True Nature, is readily available as the in-breath. The true presence of who we are is here now. Present moment awareness continues to reveal the nature of reality. Our true essence, the Self, is here always. Our own hearts are our passage to freedom.